My name is Andreas. I'm 49 years old and from Stuttgart / Germany. After reading a while and learning many things about pins and their electronics I decided to subscribe to the forum. A few weeks ago I startet my first pinball project. I'm trying to bring a Power Play (MPU 2518-17) back to life. After it's many years of hibernation I'm trying to restore the pin. 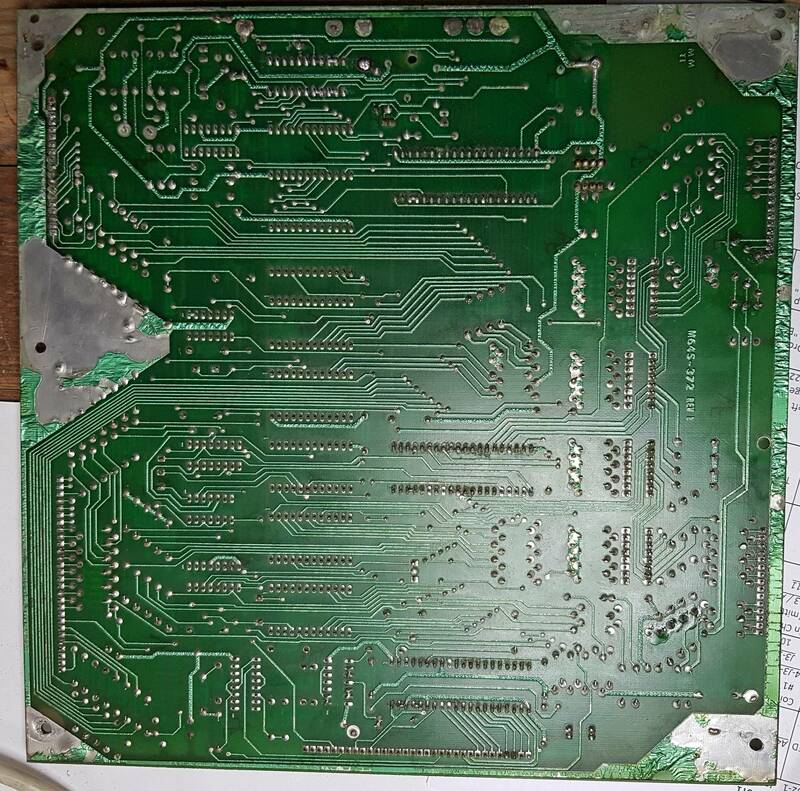 The MPU board had the expected problems with oxidation so i changed all headers and sockets with new ICs (U8, U9, U10, U11) after cleaning the board carefully. It boots fine but there seems to be a bigger problem with the switch matrix. After I got several wrong (and differend) results on switch testing, I isolated the MPU from the playfield and connected only J4. Then I measured the Strobes and Inputs on J2 with a scope from PIA up to the header pins. I got readings of very nice and crisp signals up to the anode of the Diodes. In case of ST0 the diode CR43. On the kathode side of the diodes the signals goes bad. I looks like the signal can't "discharge" fast enough. Or some other signal or potential is crosstalking and keeps the strobes on "High". Sometimes after powering up the signals on the strobes are good. But only for a few minutes the they stay high again. I'm staring at the schematics for hours and disconect caps and resistors along the trace. But no difference. Any ideas what can cause the signals to stay high? Thanks for reposting here sinus. Can you go into more details about the switch issues you are having? Are some switches not responding? Are some switches activating other switches within the switch matrix? 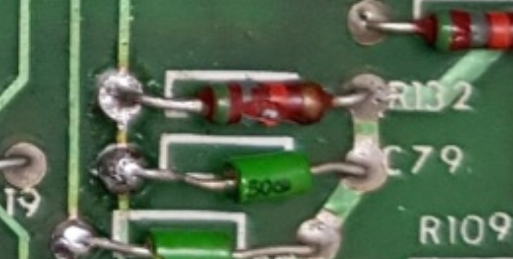 What happens if you connect the anode leg of a spare 1N4148 diode to the anode of CR43 and measure the floating unconnected cathode leg? 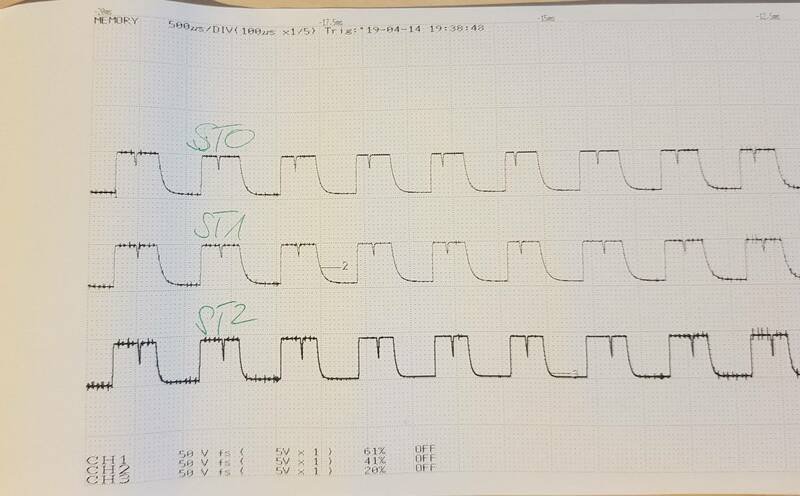 Do you get the same reading on your oscilloscope? 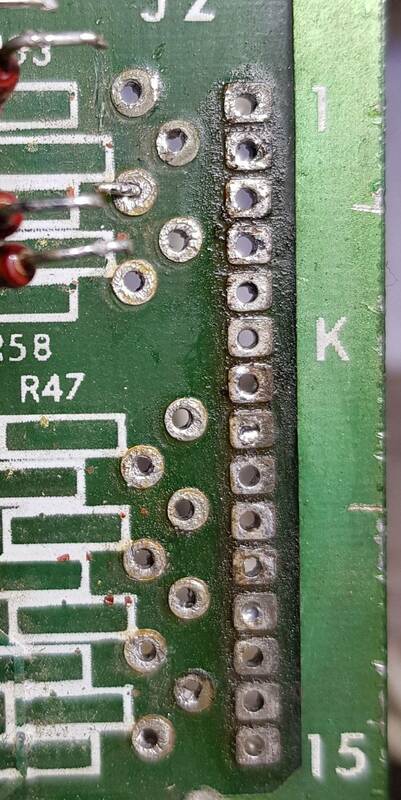 Can you post some clear high resolution pictures of your MPU board so we can see how much battery corrosion it suffered? Thank you Quench for taking up the thread. 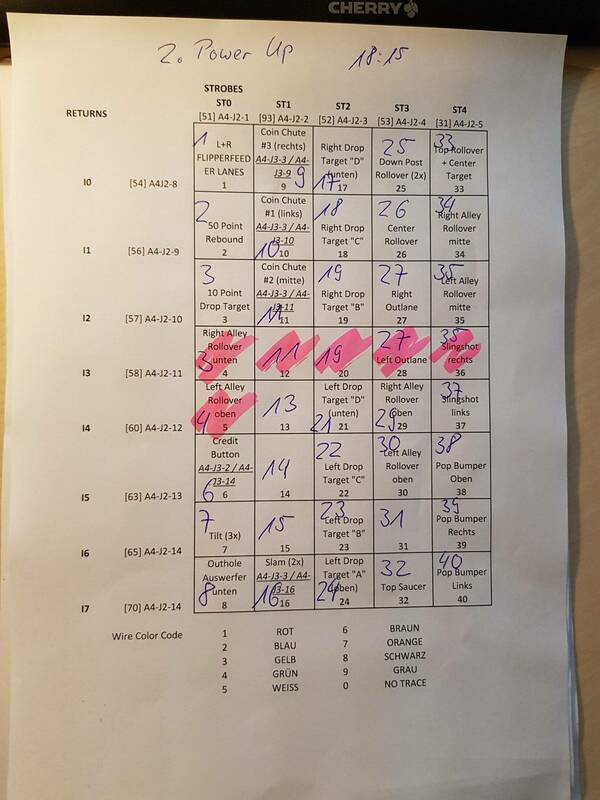 I will come up with some HighRes pics from the board and a detailed switch matrix table with listed switch numbers showing during the test as soon as I am home from work. When I'm doing a switch matrix test even without playfield the disaplay shows me switch "1" as closed after booting up. Somtimes it shows "3". And sometimes "0" is blinking. When this is the case I do the I/O tests by wire jumping Rows and Colums from J2 and read the Numbers from the Display. Nealy every new test shows a different result than the test before. 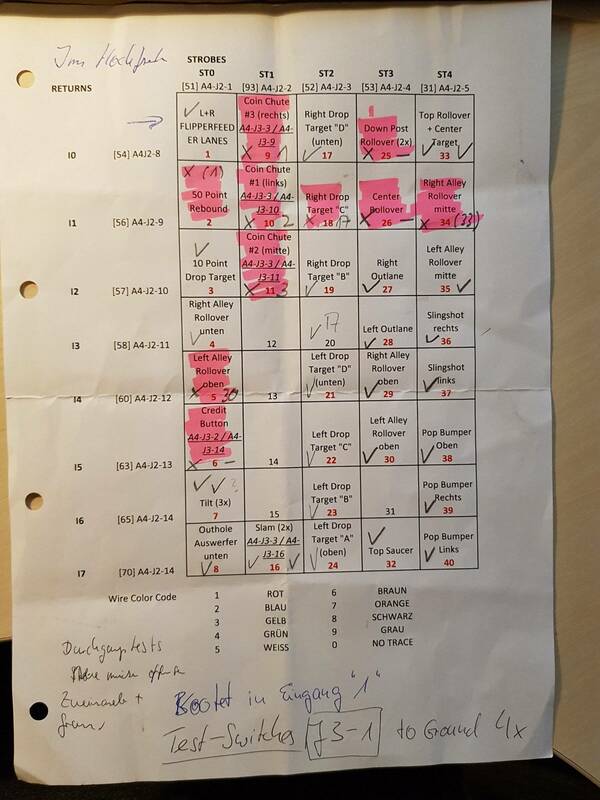 One time some switches are missing completely, next time Input-Row[#1] shows same numbers as Input-Row[#0] tested before. I can not recognize a pattern to encircle the problem at one specific Strobe or Input. 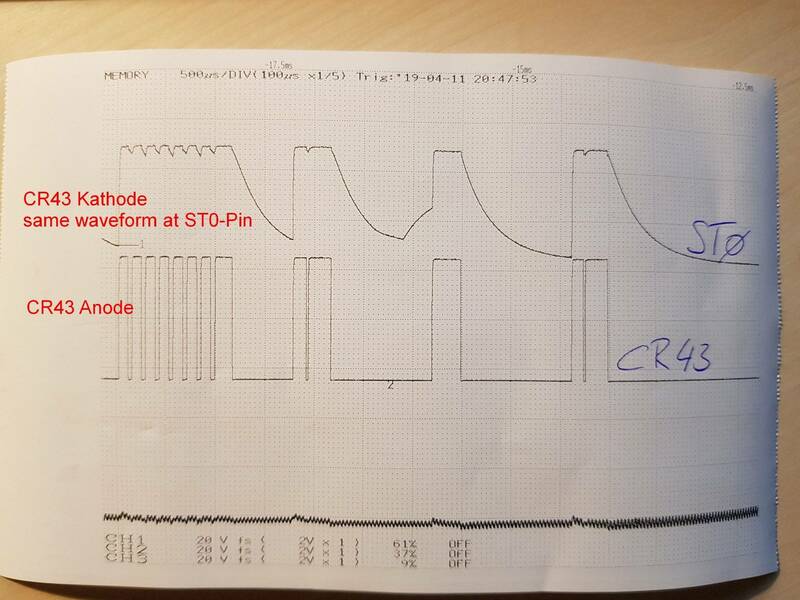 The only common is that the signals stay neraly at high level so there is no correct strobing...but only from the katheode side of the diodes (as in the printout). 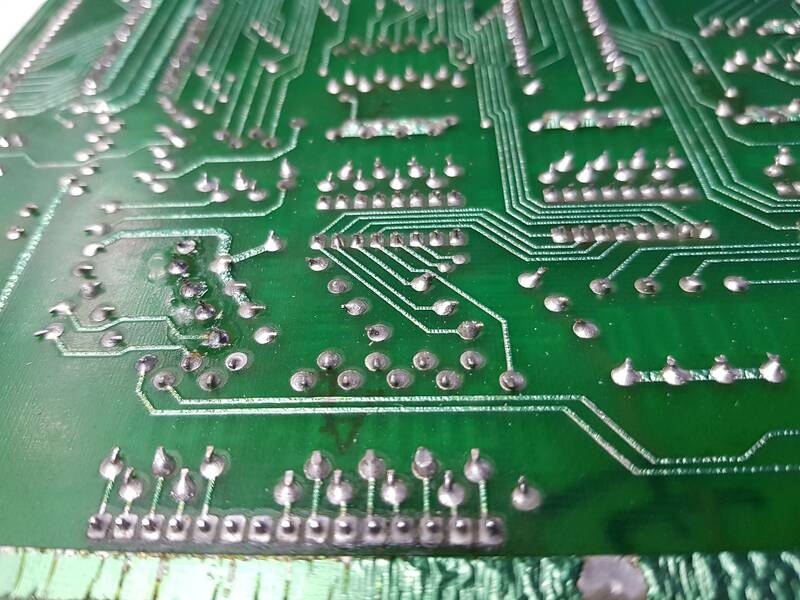 It sounds like you might still have some resistive corrosion on the MPU board to deal with. It can get underneath the dip switches which can be difficult to see. The dip switches are also a part of the switch matrix. So use your multi-meter to check it. The resistance of all the switch strobe lines and switch return lines at the J2 pin header should measure about 57k ohms with respect to ground. If you get any resistance readings that are much lower then this is likely your problem. to the OP, Quench is an invaluable resource, heed his advise! I'm FAR FAR less experienced but was thinking the same as Quench about corrosion thus I will second his suggestion. I'm very grateful that so skilled people in this forum like Quench are pushing me into the right direction. I already read many of his comments helping people to get their pins running. Especially in hopeless cases. quench : Thanks for taking care! Faulty readings are marked red. And here the readings from strobes and returns to ground as you recommended. Measured with dip swiches in ON and OFF postion with same readings. Your PIA's don't look new. Try known working ones. Yours look bad, date code on U 11. And U 10 has almost no marking, Usually a sign of counterfeits. infinity resistance (open) pull down resistor @ R132? In one of your picture it looks like it could be physically damaged. Both Quench and BarakandI hit onto this one. "ST0 --> GND 1 MOhm (!)" Resistor R132 is open yet C79 is still good. You are seeing the small value of C79 affecting the signal waveform as seen in your first post picture. Your PIA's don't look new. Those PIAs are indeed remarks from China. I've used a number of them without issue. Also, the low resistance readings at the adjacent signals I3 and I4 indicate they are shorted to each other, infact all those resistance readings besides ST0 are too low. It looks to me like you may have resistive corrosion under the pin headers at J2 and J3. It doesn't look like there's any corrosion under the dip switches. 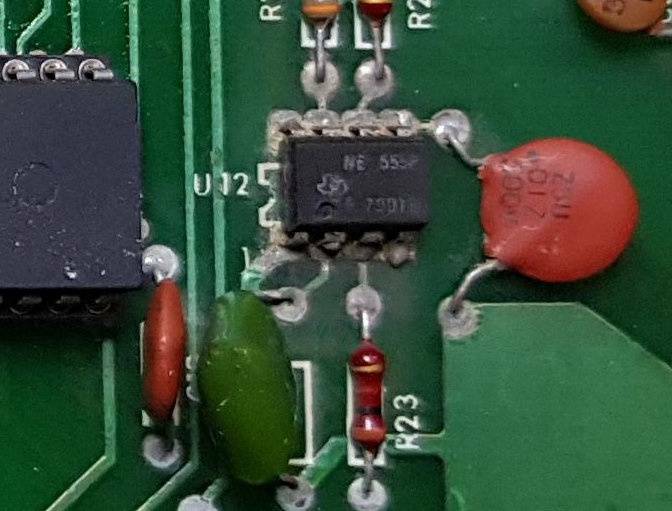 If you measure the resistance across the I3 and I4 signals at the J2 header which is pins 11 and 12, you should measure about 114k ohms. All the adjacent pin signals should measure around 114k ohms across them. U12 also has bad corrosion - when you get some time remove and clean up that area. Took it out today. Dead resistor! Soldered in a new one. 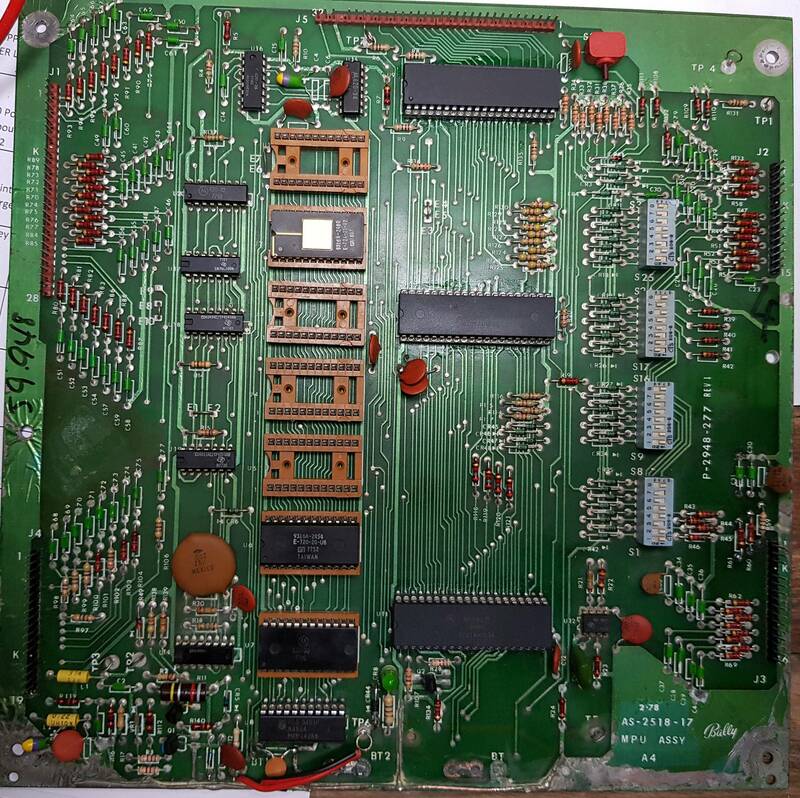 Days ago I replaced the header pins on J2 as recomended in every pinball tech channel concerning Bally MPU. I didn't take care too much on the front side. 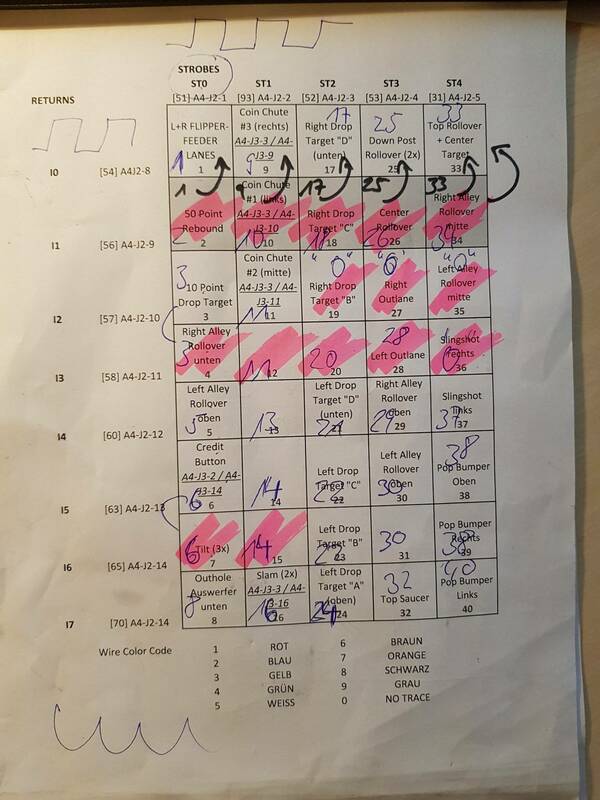 Today I took out the header pins from J2 again.... after measuring the pins continuity with your predicted values of shorted header pins between them... chapeau man !!! I overhauld the J2 section. And worked on both sides against corrosion. Could it be that my first attempt of renewing header pins worsed it? I used ab bit more flux to burn the oxides away...Are the residues of flux conductive??? I'm taking my hat off! Thank you! Good luck when you plug the MPU board back into the machine and let us know how it goes. I reinstalled the board today and expected a nice starting up. All diaplays show static zeros on all digits. And the board doesn't change into diagnostic mode when the test switch pin is shorted to ground. I only had J4 and J1 connected. Then I ozilloscoped the new J2 headers with their Strobes and Inputs. The signal quality is so much better now. But I wonder why the signals on all Strobes are the same pattern. Is that normal? I expected a different pattern on each strobe. I have no idea what could have caused this problem. Even with the faulty signals an semi shorted header pins on J2 the the game started up an got into reday mode. Maybe those “remarked” PIA’s aren’t so good. I was taught step 1 in MPU repair is make sure you have known good IC's at U2 through U11, Before getting the soldering iron out. So now you have the same issues as when you started. Swap in good know PIA's. May not be the problem, but easy to eliminate those. As far as remarks go, I have gone through quite a few from China. With PIA's I found 10% DOA, about 20% die young, and about 70 good. The MPU will boot with about 90% of them. Which lights went on? Was it just the general illumination lamps or also the feature lamps? If the feature lamps came on, were any flashing? Were they all stuck on or just some of them? Does the LED on the MPU board flash seven times on power up to indicate the MPU board has passed self diagnostics? If all the switch strobe signals show exactly the same waveforms then it's indicating that game execution is getting caught in a tight loop. Sounds a little like you may have an interrupt problem possibly the display interrupt generator is running too fast. The switch strobe signals (U10 PA0-PA7) are also used to address lamps and the displays. 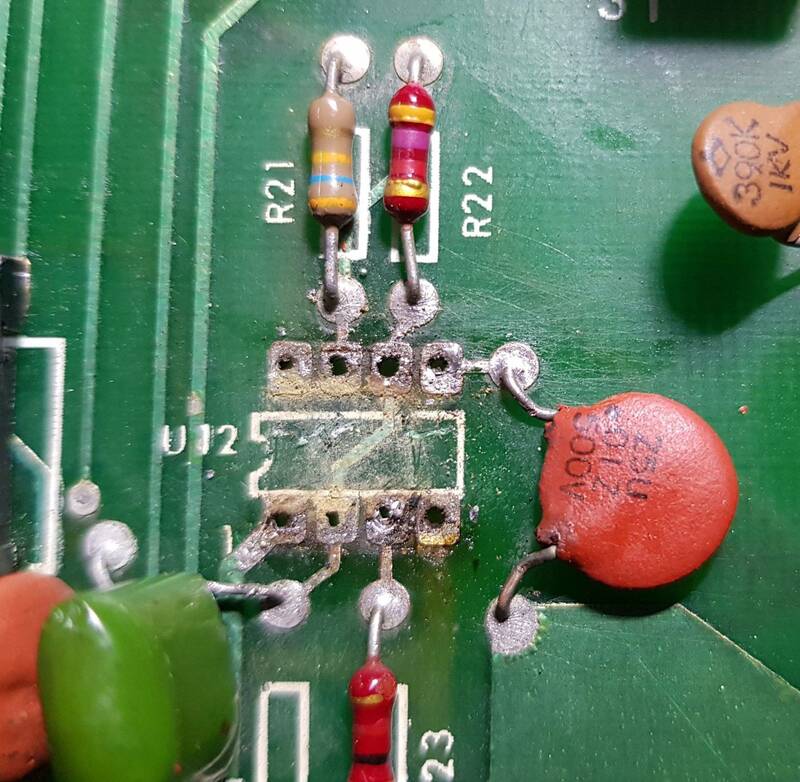 What happens if you disconnect J4 from the lamp driver board to isolate it from the U10 PAx signals? 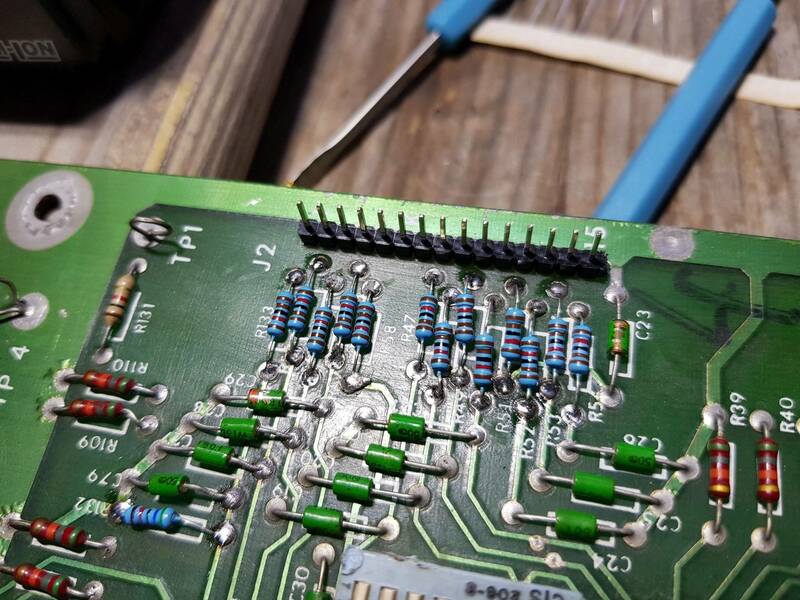 Have you re-terminated the wire connectors that plug onto the MPU board? 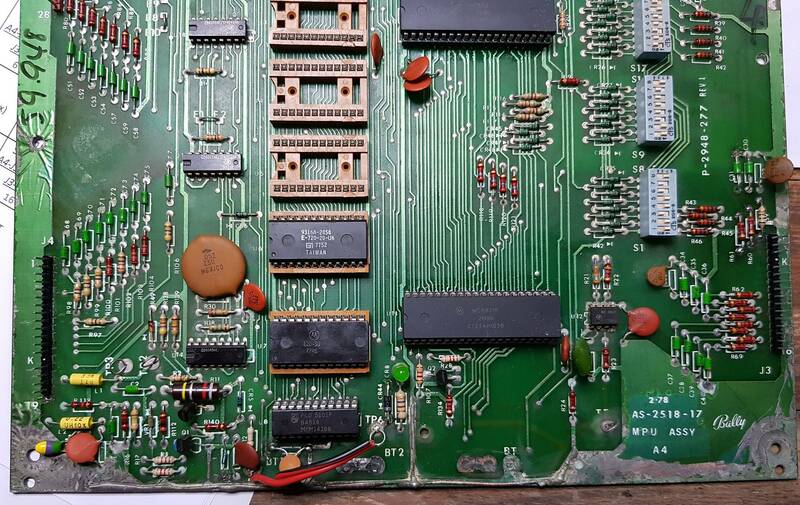 Looking at the photos of the board I see there are brown Palmer IC sockets. Those should be replaced. I also see the PIA chip U11 does not have a socket? If you are doing this as a hobby project, keep up and good luck. Otherwise this board is toast and I would not waste time on it. 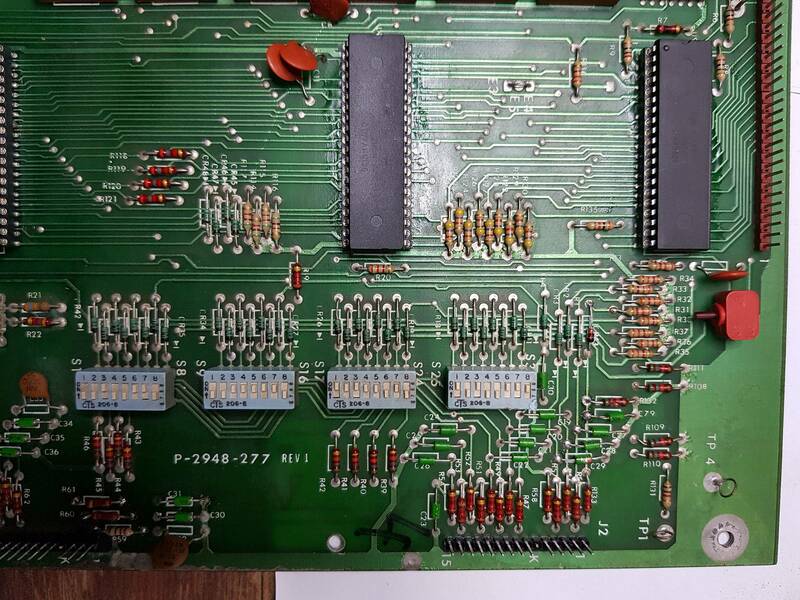 Keep in mind the board will never run reliably with the brown sockets. The MPU is passing it's self-diagnostics and flashes 7 times on power up. So I went for the signals on U11 and U10. 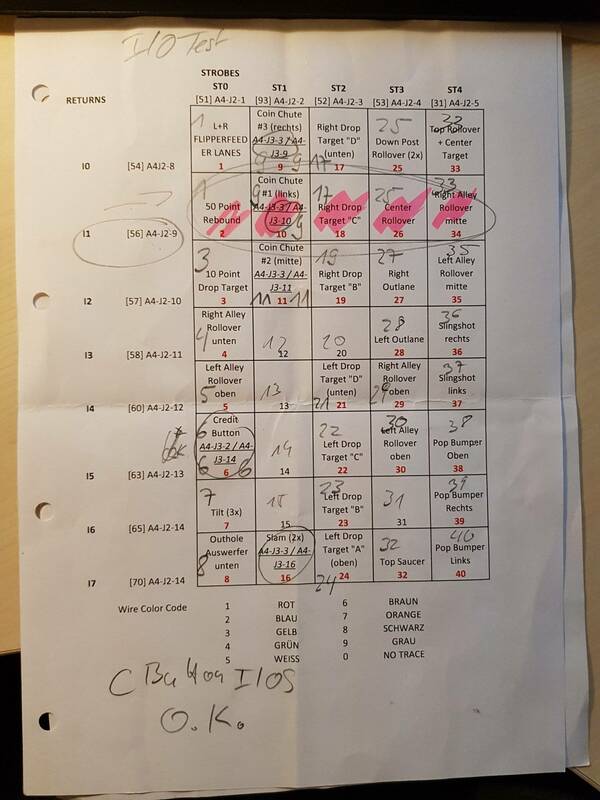 Pin 40 of U11 ist static at 5V. Pin 18 of U10 is static at 0V. I overhauld header J4 because of the experiences on J2. But with minor success at this time. Then i wanted to look for the signal from U12 and when I touched pin 7 with the probe the machine startet it's game ready tune and fired coiles and chimes...and scared the .... out of me! You already pionted out U12. I put in a new one in today. @bigal56 : The PIAs are in sockets. Maybe it's the perspective of the picture. The new sockets for the RAM are one the way and will be replaced. It's a hobby project. I'm just getting in touch with pinballs and solid state electronics. A new U12 is soldered in. Everthing is O.K. now. MPU is booting fine. Coils are all triggered one after another, chimes are playing and the strobe signals look much better know. Great to hear - the display interrupt generator (U12) was suspicious of causing that lockup issue. So I startet to look for the next problem where I'm in need of a hint. Some coils are firing twice others not at all. Shorting the transistors on the SDB to ground fires only the right coil at one time. Can it be that there is a problem with the decoder U2 on the SDB? 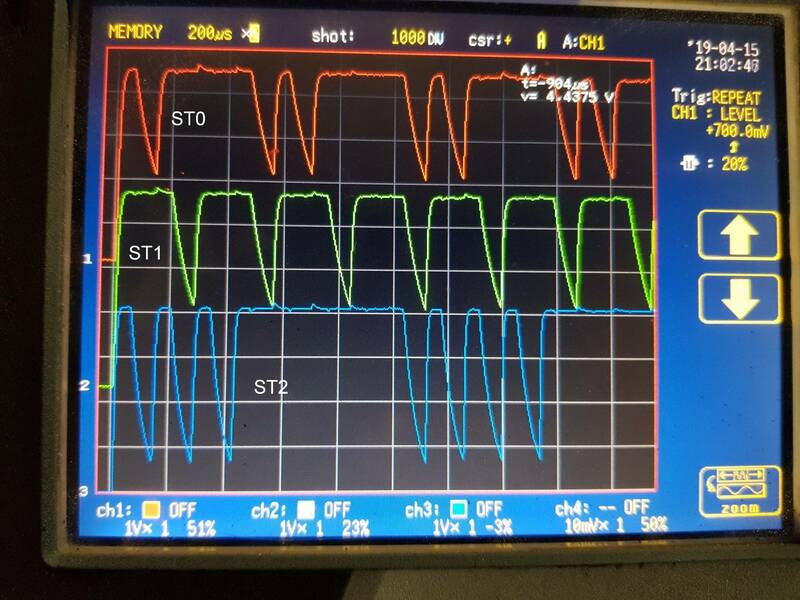 Intermittent issue is probably related to connectors mpu j4 to driver j4. Put the game in solenoid test and check out the sol a, b, c, and d signals at the driver board 74154. All should change slowly with the solenoid test pulses, if one is stuck always high work backwards to the mpu looking for where the signal drops out at.